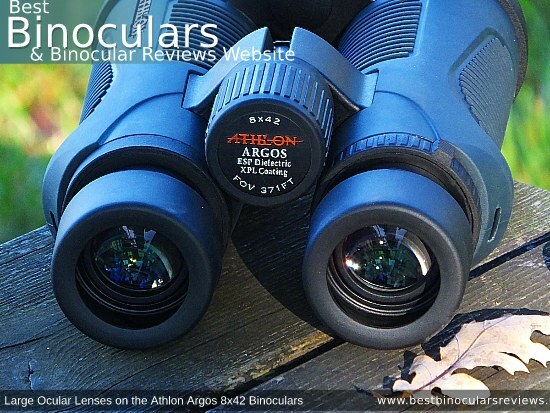 With 8x and 10x powers available in 34mm, 42mm and 50mm options, as well as a 12x50 version, the Argos series from Athlon Optics is a substantial one. The Argos series is also their main mid level offering and comes with a MSRP of between $279-$209 (depending on the model), which means they sit right in the middle of the BBR mid price range category. 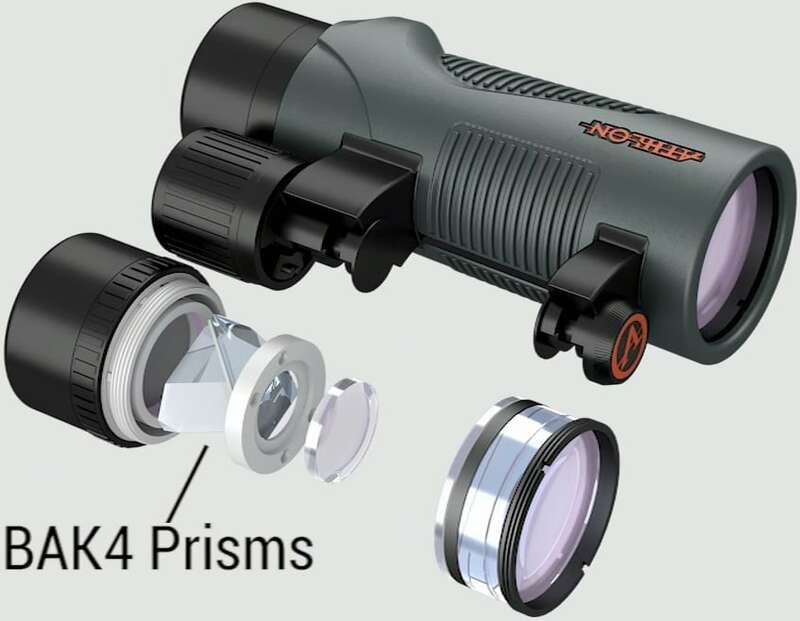 This is probably the most competitive category as almost every optics brand out there has at least one series within their stable at this price level . 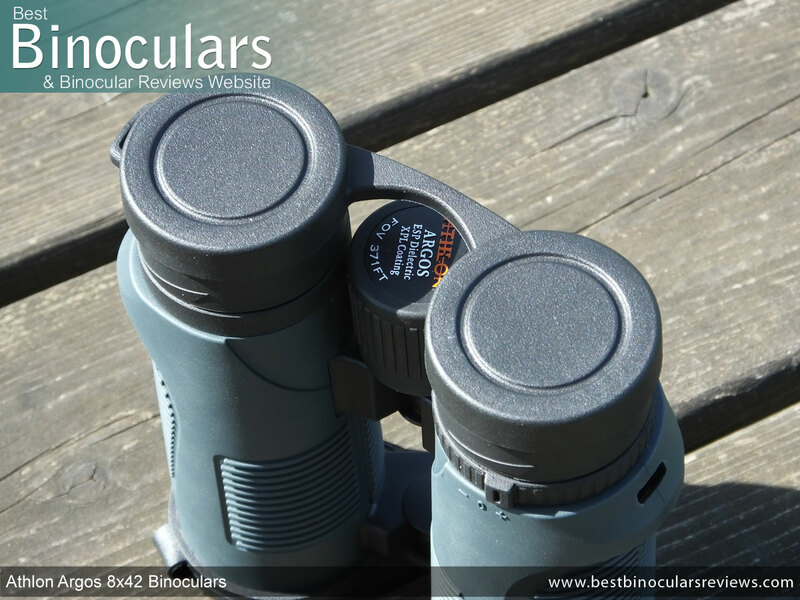 Thus to stand out and rank amongst the best mid priced binoculars, you really do have your work cut out. 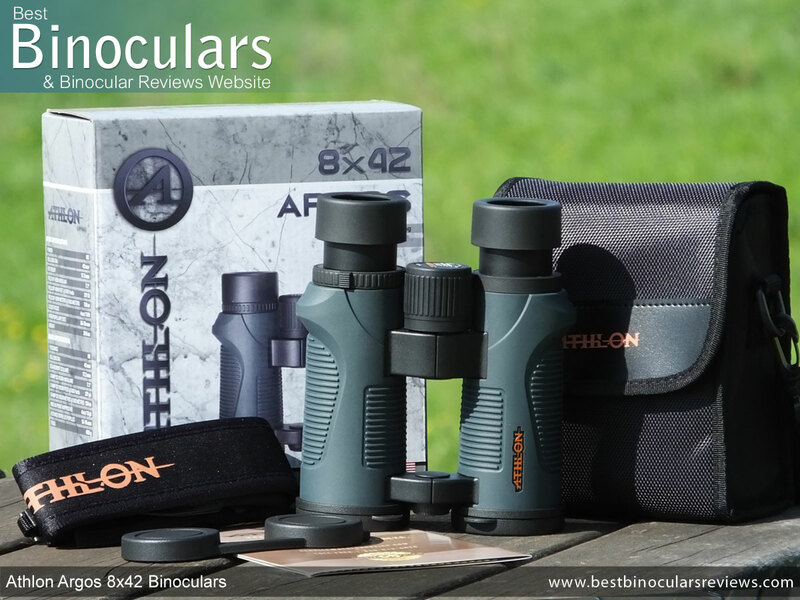 To see just how well Athlon have or have not managed in this endeavor, I decided to try out the most popular model within this series and so below you can find my full Athlon Argos 8x42 binocular review which I wrote after extensive research and testing conducted over a number of consecutive weeks. 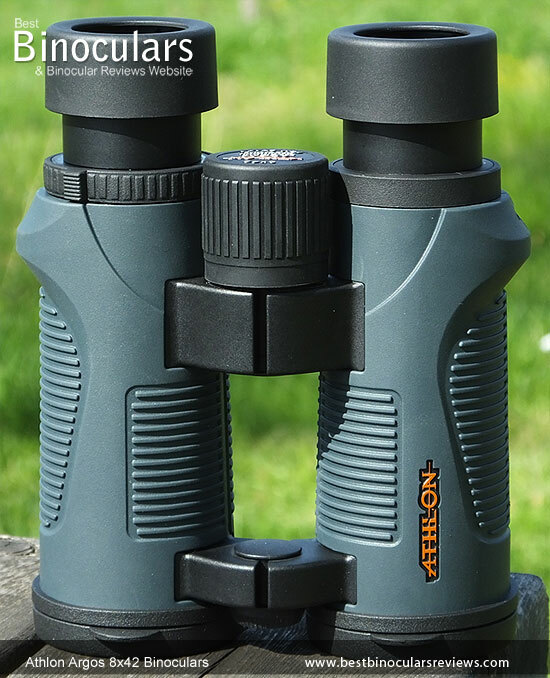 In general I really like the exterior and all round design on these Athlon Argos 8x42 Binoculars. They feel great in the hands, robust, solid and well balanced. I like the green rubber coating. It is hard and reasonably thick, but not overly so. Thus offers a good compromise between shock absorption and toughness/longevity. On my sample it was very tightly bonded to the chassis underneath and has no chance of sliding about which is good as it is something that I do see occasionally at this level. Athlon Optics have also added deep grooves to sections of the cover that not only add to it's styling, but also improves the grip level. I like the open bridge body design, with two thin hinges on this instrument. It opens up more surface area on the barrels and provides a lovely secure place to hold onto when carrying them about one handed. An area where these and most other mid range bins differ form the more expensive options including Athlon's Ares models is that they don't have a magnesium chassis. However unlike most at this level that are Polycarbonate, these are marketed as having a "polymer composite" chassis. But they don't stipulate exactly what materials are use in the composite. Now I'm no expert in these matters, but is this just basically the same thing just worded differently? Please drop me a line or comment at the foot of this review and let me know if you do! The chassis is fully o-ring sealed and will survive being accidentally submerged underwater. Remember this is also important in dry conditions as it prevents dust from entering. They are also "Argon purged" which means the internal air is replace with dry argon gas which will prevent internal fogging or misting up of the lenses. I am not sure what the eye-piece housings are made from as it is hard to tell, but what I can say is that the twist-up eye-cups on these are excellent. The action is very smooth, you get a good level of eye-relief and there are two intermediate click stops. This along with the fact that there is enough friction to make them stop and stay at any point between fully retracted and extended means they are highly customizable. Whilst not super plush, comfort is good as well, the cups have a 43mm outer diameter and a reasonable amount and level of soft ribber padding. Whilst not made from metal, it has a nice raised and embossed face plate and the deeply grooved rubber track exterior provides an excellent grip. At 32mm in diameter, the wheel is reasonably large, and well positioned. This makes it easy to reach and as the mechanism is super smooth, I had no problem at all easily and accurately turning it with just one finger. The focus gearing is what I would describe as being low, as it takes just over 2 turns (about 730°) to take the focus from one extreme to the other. Considering that you get some instruments that take less than a full turn, this is a big difference. What this means is that fine tuning the focus is that much easier, but on the flip side, it takes more turning and thus longer to make a large focal adjustment. As you can see from the table above, the dimensions are fairly typical for an 8x42mm binocular, so not too much to report or expand upon here. The two narrow bridges that connect the barrels together are metal and feel very solid which is an important feature in ensuring that even when dropped, the optics don't go out of alignment. I also liked the tightness of the hinges, in that it is not too hard to open and close them, but at the same time your desired setting is secure enough. The IPD range (distance between the centers of the eye-pieces) is pretty standard with a minimum of 5.6cm up to 7.3cm. Athlon Optics don't supply any details as to the make-up of the lenses in the eye-piece, so I can't really elaborate or comment here. I can say that I took my ruler to the external ocular lens and measured it's diameter to be 23mm diameter, which for a 42mm binocular is really good and up there with some of the larger ones I've used and measured. The actual benefits of this include being easier to align your eyes up with them so as to ensure you get the full view without any blackening of the image on the edges and potentially a higher image resolution. For more on this and to compare these Athlon Optics Argos 8x42 binoculars with others, you can check out my post on Ocular Lens Size in Binoculars. As you can clearly see on the images above and right, the 42mm diameter objective lenses sit back quite deeply from the ends of the barrels (9mm). This is something that is good, because not only does this protect them from damage and getting dirty, but the overhang acts a little like a lens hood that you see photographers use, which can in certain instance reduce lens flare. No ED Glass - is that a bad thing? 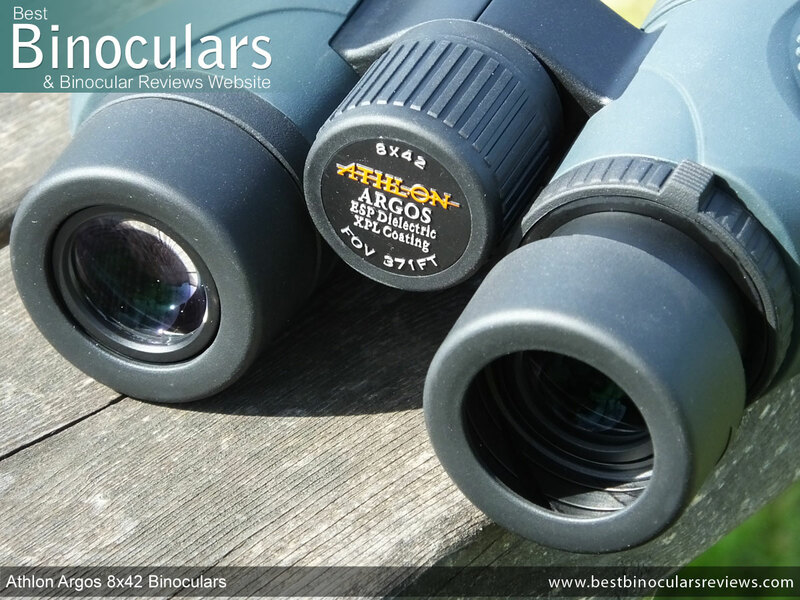 Unlike the more expensive models within the Athlon Optics range, the Argos does not use ED (extra low dispersion) glass lens elements in the objectives. Rather it has "normal" low dispersion optical glass in the lenses, but is this all bad? When it comes to marketing, one of the current buzzwords in the optics industry is ED glass and so many manufacturers will have you believe that ED lenses are essential and that they drastically improve image quality and reduce color fringing. Whilst this can be true, it is not always the case, especially on lower cost and mid level instruments like these. 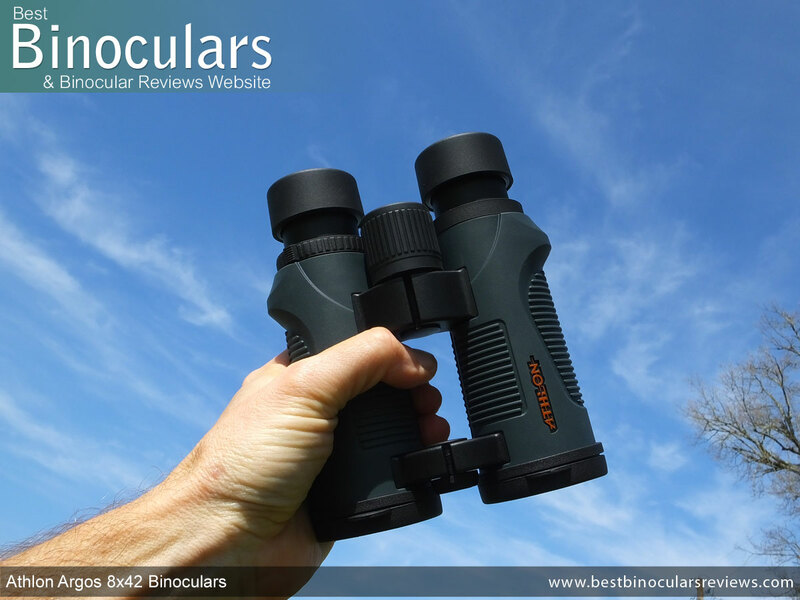 I have on many occasions seen less color fringing on a good quality and well made non ED Glass binocular than on that of an average quality ED instrument. For more, take a look at my article on Are Binoculars without ED Glass Any Good? To see how these actually performed in this area, take a look at the Optical Performance section below. As is illustrated above, these Athlon binoculars use roof prisms made from BaK-4 glass to correct image gets inverted as it passes through the system. 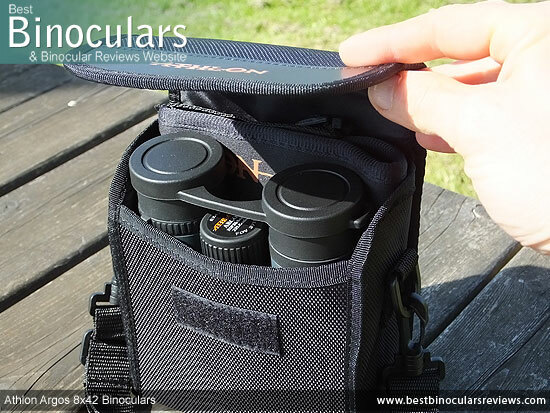 The fact that it is made from BaK-4 glass is good and what we most certainly want to see as the cheaper BK-7 glass is usually deemed to be less desirable for the use in binoculars, but at this price range this is mostly to be expected and I would be somewhat shocked to have discovered otherwise. I was super impressed to discover that all the models within the mid-range Argos series use all the same coatings on their lenses and prisms as that of the more expensive ranges within their line-up. Athlon Argos 8x42 binoculars are Fully Multi-Coated. Not fully coated, not multi-coated and not just coated: Fully Multi-Coated. The precise wording here is important and something to always look out for when buying binoculars, because this means that all lenses throughout the whole optical pathway have been treated with multiple layers of an anti-reflection material. 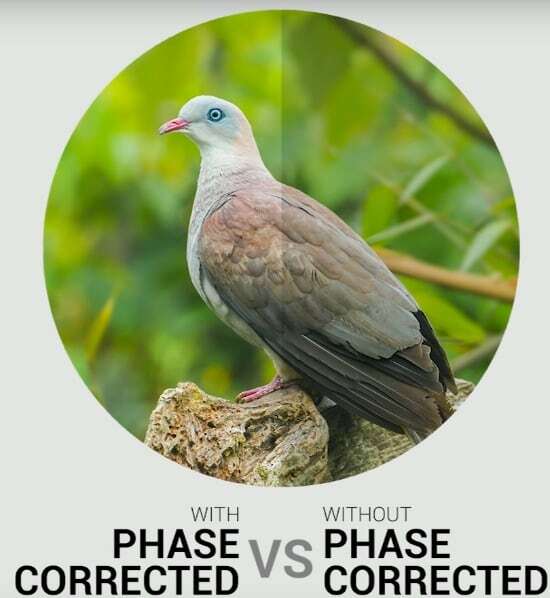 For certain this makes a real and observable difference to brightness and general image quality when compared to those with fewer coatings on only some lenses. As well as being fashioned from BaK-4 glass, the roof prisms have phase correction coatings applied to them. Not only does this increase image resolution, compared to those roof prisms that are not phase corrected, but this is an important detail to look for as it is a great indicator of an instruments overall quality at this price level. At prices around the $200 mark, it is common to see binoculars using silver coatings on their roof prisms. This does a good job of increasing the level of reflectivity for a brighter image than others that will use cheaper aluminium ones. 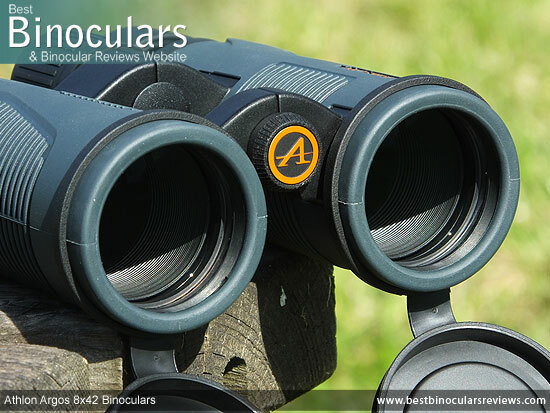 What is super impressive is that Athlon Argos binoculars go even further and use the same and much more expensive dielectric coatings that you only regularly find on high end instruments. Dielectrically treated prisms can have a reflectivity of more than 99%, which surpasses aluminium and silver treated ones by a long way. 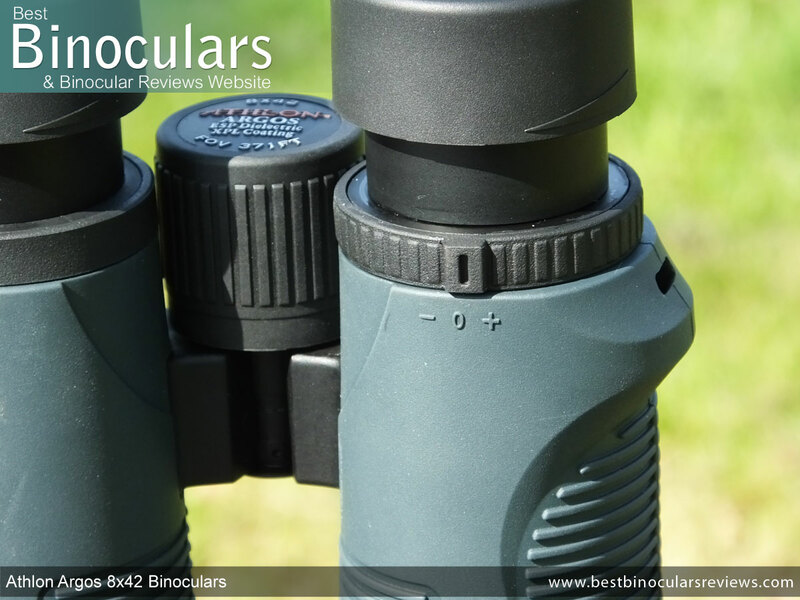 Very few manufacturers of binoculars a this price level will go the extra step and added cost of applying special protective coatings to the exterior lens surfaces. So this is also very impressive. 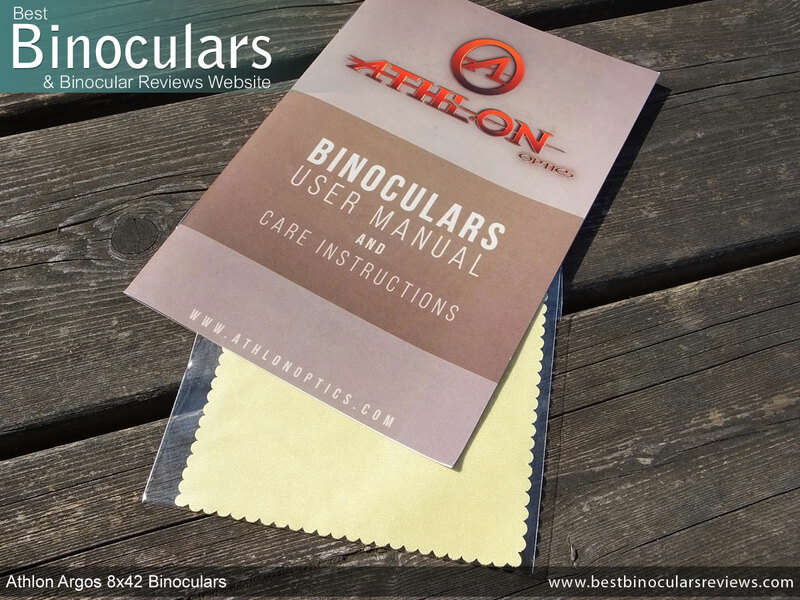 Athlon's "XPL Coating" adds an extra layer of protection to your lenses safeguarding them from scratching and making it less easy for dirt, dust and oil (watermarks) to adhere to them. 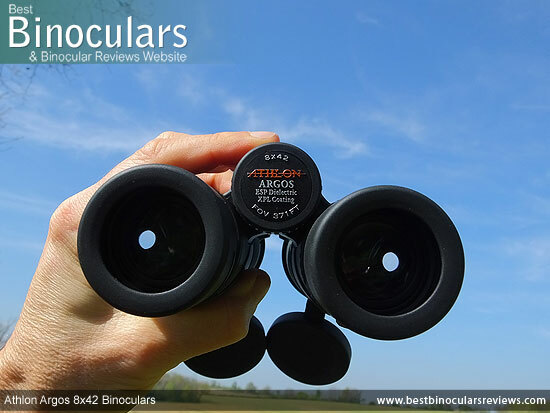 The 8x42 Athlon Argos is advertised as having a 7.1° angle of view, which translates to width of view that is 371ft wide at a distance of 1000 yards. Whilst far from being bad, it has to be said the stipulated figure is a little disappointing. However what I would like to add in regards to the width of view on these is that during testing, I never felt that it was too constrictive and whilst narrower than the best 8x42's, it is not really noticeable when compared to the average. So whilst yes, I agree 371ft is less than some, you really can't notice much of a difference until you get to those very wide view instruments at the top of the table. So my advice is to take note of it, but unless you specifically require a really wide view, don't blow this too much out of proportion. Whilst not class leading, the 17.1mm of eye-relief is good, but not quite enough (18mm) to make it onto my list of binoculars with long eye-relief. 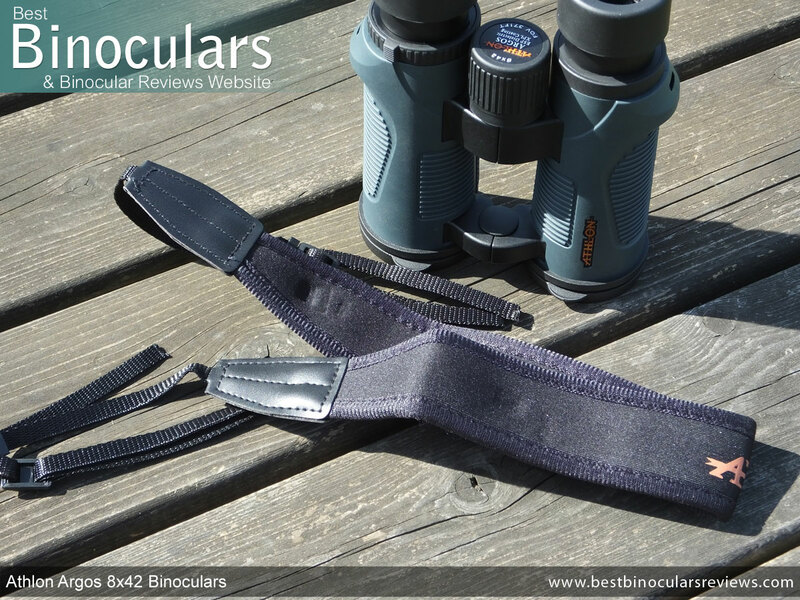 However having said that 17mm is still easily enough for almost all users who wear glasses to get the full view and this with the excellent twist-up eye-cups, means that you have plenty of flexibility here to get your preferred setting just so. The advertised close focus distance of 4m /13ft is not brilliant (I look for anything under 6ft to be classed as excellent). However I think that Athlon Optics are doing themselves a massive injustice here as I measured the closest that I could focus on an object with my sample Argos at only 1m 85cm / 6.1ft, which is far more like it. I know that almost all manufacturers factor in a margin of error when quoting the close focus distance, but to make it more than double the amount is being way too conservative! 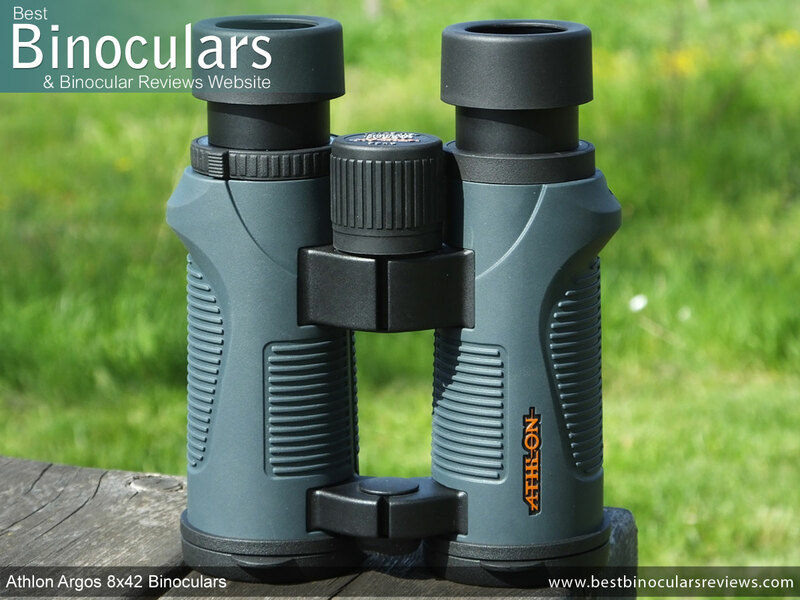 So if my sample is the norm and I have no reason to assume it is not, then the close focus on this Athlon Argos is very near excellent for an 8x42 binocular. However unless (or until) Athlon can confirm this for me, I will have to go by the stated specifications when scoring them below. 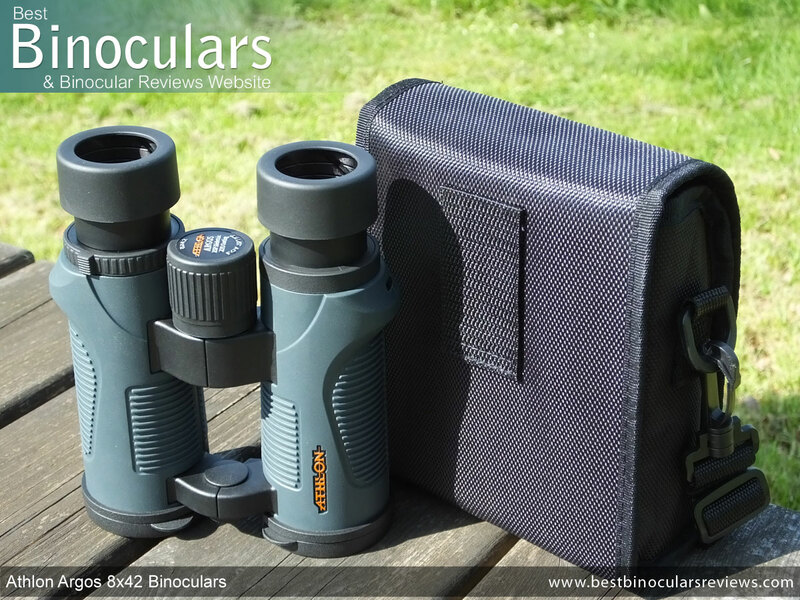 If you are interested, you can see how I arrive at the score for the optical stats on the binoculars that I review here: Optical Stats Score on BBR. Update: I have been in contact with Athlon Optics and it looks like the quoted close focus may be as I suspected incorrect. I am not sure what the official figure will be yet, but I have updated the score to reflect the improvement. I will update the official distance as and when i get it. 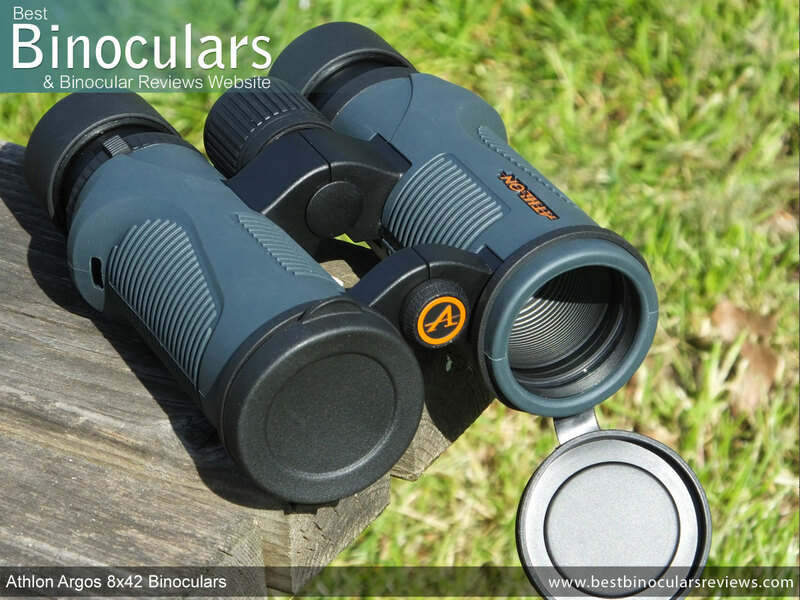 Note: To arrive at these conclusions below, I took into consideration my general thoughts and notes I took whilst testing and using them out in the field and also I directly compared the view, side-by-side of these Athlon 8x42 Argos binoculars against both my mid range and very high end "alpha" type benchmark 8x42 binoculars. These comparisons were conducted on two occasions. Once in good light and again in poor light on a overcast, dull and very wet day! The first thing that really impressed me was the image brightness. Whilst perhaps a fraction less bright, almost blow for blow and no matter where I looked, be that out over open fields, deep into dense foliage or nearby observation of birds on my feeder, these looked to be a very close match to that of my alpha 8x42's. In good light this is not too surprising, but in poor light this is impressive as these Athlon's definitely outperformed my mid range 8x42 benchmark and came within a whisker of the alpha's.. 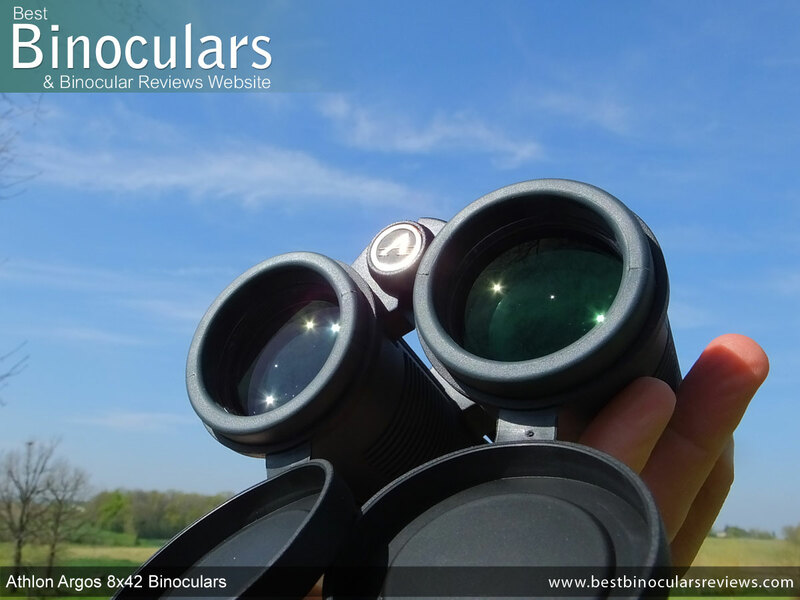 Thus I rate them very highly in this section and whilst you may get a few 8x42 binoculars costing around $200 that will match these in this regard, they will be rarer than hen's teeth! Sometimes a binocular that produces a bright image, can also have one that looks a little washed out and lacking a little vividness. 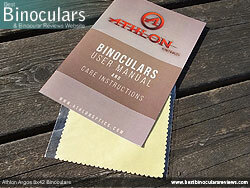 This was not the case with my sample Athlon Argos 8x42 binoculars, the image looked bright, but also colorful. At the same time the colors were not overly contrasting or vivid so as to look unrealistic. 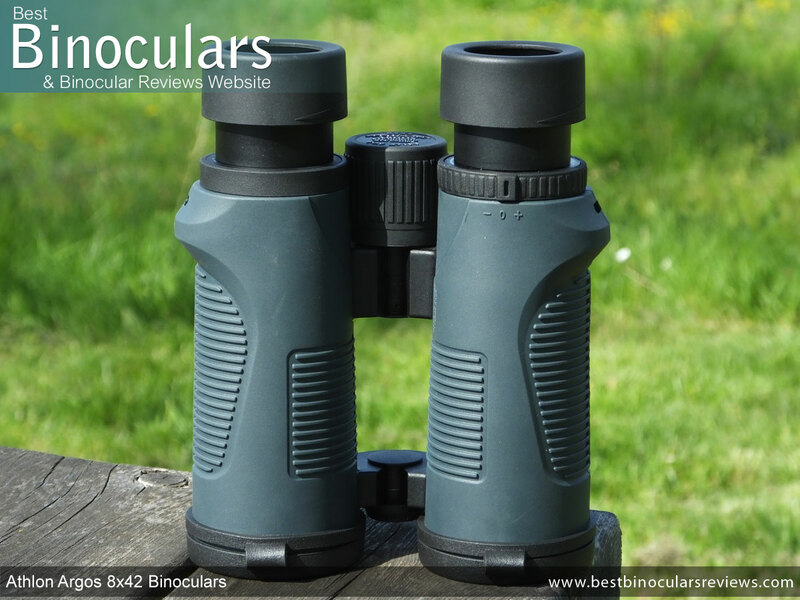 In the main optics section above, I mentioned how not using ED glass in the lenses was not necessarily a bad thing and that especially at this price range many no ED glass bins can and do show as little color fringing in the image as similar priced ED binoculars. This did indeed turn out to be the case with these Athlon Argos binoculars. Whilst it is true, when I very carefully examined the edges of some leaves lit up by a bright sky background, I could see that there was a fraction more fringing than that on my very high end alpha benchmark. The amount was no more than that of my mid range benchmark which does have ED elements within the lenses. Also worth stating is that unless you are really looking for it, the level is so low that you really don't notice it at all. So really unless you plan on spending a heap more money, this is not something that I would be too concerned about. Try as hard as I might, I never observed any abnormal distortions like curving or bending of the image that you sometimes see. Fuzziness and blurring of the image at the edge of the view was really minimal and well within the levels that I normally find. So not quite up there with the very best, but easily on par with the vast majority at this level. The Athlon Argos 8x42 binoculars come with the usual assortment of accessories which consists of a carry case, neck strap, lens covers, rain-guard and a cleaning cloth. As with just about every mid-range binocular that I have ever used, the carry case and the neck strap just falls a little short in terms of the attention to detail and general luxuriousness. 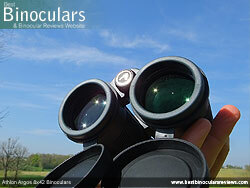 There are a number of ways to keep costs down and thus produce a lower costing binocular that we all want. You could do the same as some brands and reduce the quality of the exterior or perhaps use lower quality optical glass and apply less coatings to them, masking the fact by using confusing terms or highlighting irrelevant features. 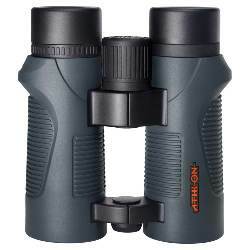 To the unknowledgeable or those who don't do their research, they probably would never know and would just be happy that they have a shiny carry case..
Or as is the case with these Athlon Argos binoculars, keep the instrument at the highest level possible and just slightly lower the dial on the accessories. I am sure that you will agree with me, so long as the main function of the case and the strap is not compromised, this is by far the preferred option. Soft carry case looks well made, but it's padding is a little on the light side and lacks a separate pocket. The Velcro closure is great for ease of access, but is less secure than a Zip and you need to be careful when opening not to make too much noise if you need to remain stealthy. Could be important foe some wildlife enthusiasts, birders and hunters. 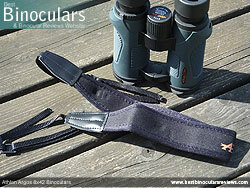 Neck strap is well padded and comfortable. This could be improved with a curved design, a underside with more grip and perhaps a quick release fastening system. Both the objective covers and the rain-guard fit and work very well. Standard cleaning cloth - good for very light use. For deep cleaning of the lenses I suggest a lens cleaning kit. 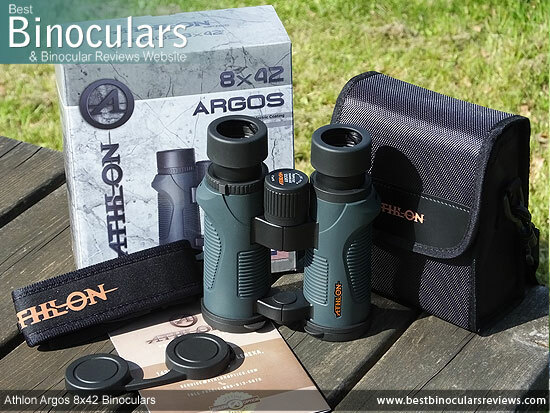 As with all other Athlon binoculars, the Argos comes with an excellent lifetime warranty and really shows the confidence that the company has in their products. The table below displays a small selection of Mid Priced 8x42 binoculars in the BBR database. Taking into consideration their price point and comparing them to others within this range, I would describe the Athlon Argos 8x42 binoculars as very good to excellent in most areas. They have a bunch of features and components that are as good as any mid level instrument and a few that go above and beyond what I would expect to get within this class. 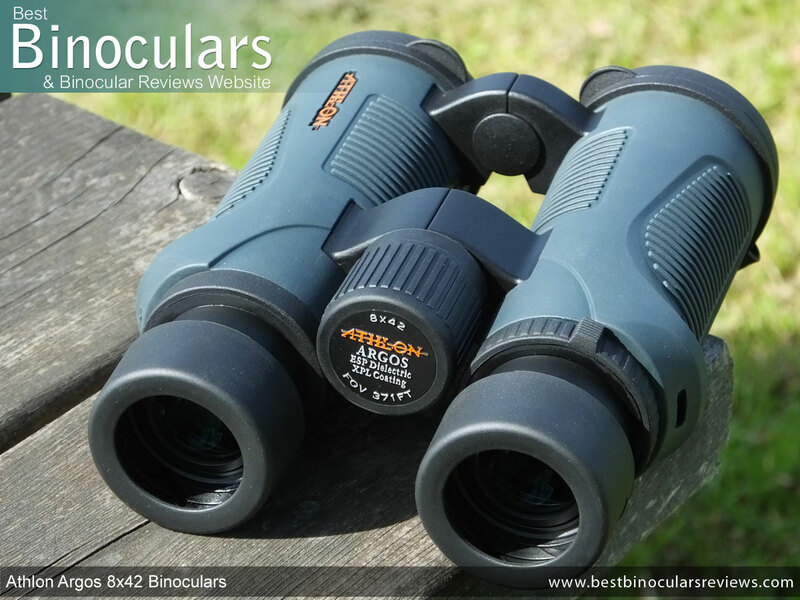 As a birder who often likes to observe small, fast moving critters at closer ranges, I personally like to have a really wide field of view on my 8x42 binoculars and so whilst not bad, the width of view that Athlon advertise these Argos binoculars have is a little less than what I would prefer. However what I have just said is based on the numbers provided in their specifications (and we know how far off they were with the close focus!). In real world testing I honestly never had a problem with their FOV and it really is not perceptibly narrower than your average 8x42 binocular. So unless your really must have a wide view, I would not be overly concerned with this. Whilst perfectly functional, when compared to higher end instruments, I would describe the included neck strap and carry case as a little basic. So for instance the case lacks a separate pocket and the padding on it is a little on the light side. However I also think that it is important to remember that in life you often get what you pay for and so within this price range they are about on a par with all but the very best.